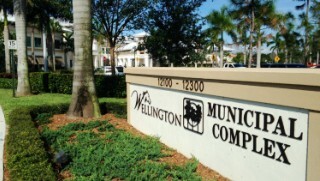 WELLINGTON — The village could turn a busy cut-through into a park, with a goal to curb speeders in a multi-family home community. But some residents fear the park is being pushed through without adequate input from those in the neighborhood, leading one to address Wellington’s council at a recent meeting. If approved, the section of Folkestone Circle between Yarmouth Court to the south and Carlton Street to the north would be shut down and converted to green space with the possibility of basketball courts, pavilions, a playground and other features. The budget is about $300,000, Assistant Village Manager Jim Barnes said. Wellington’s Community Services and Engineering departments will have an informational meeting at 6 p.m. Thursday at the proposed park site. It was a notice about that meeting that drew concern from Andy Hermida, who represents the homeowners association for his multi-family home on the Yarmouth Court cul de sac just east of where the park could be built. The other three homeowners in his building called him after recently finding the notice on their doors. “Once they came home from work and they got these fliers, they lit up my phone,” Hermida said. His HOA opposes the project because it will “take away one of our access roads,” Hermida said. The project’s goal is to cut speeding through the neighborhood, Mayor Anne Gerwig said. “But we’re not looking to shove a solution into your neighborhood that your neighborhood doesn’t want,” she added. The council has yet to vote to approve the park, Gerwig said, and residents still have time to provide input at the upcoming meeting. “We put things in the budget for discussion, but we did not vote to build that park,” she said. The village wants input on the project, Village Manager Paul Schofield said. But he acknowledged that no project has 100 percent support. “If the neighborhood doesn’t want it … generally they don’t really give people things they don’t want,” Schofield said.